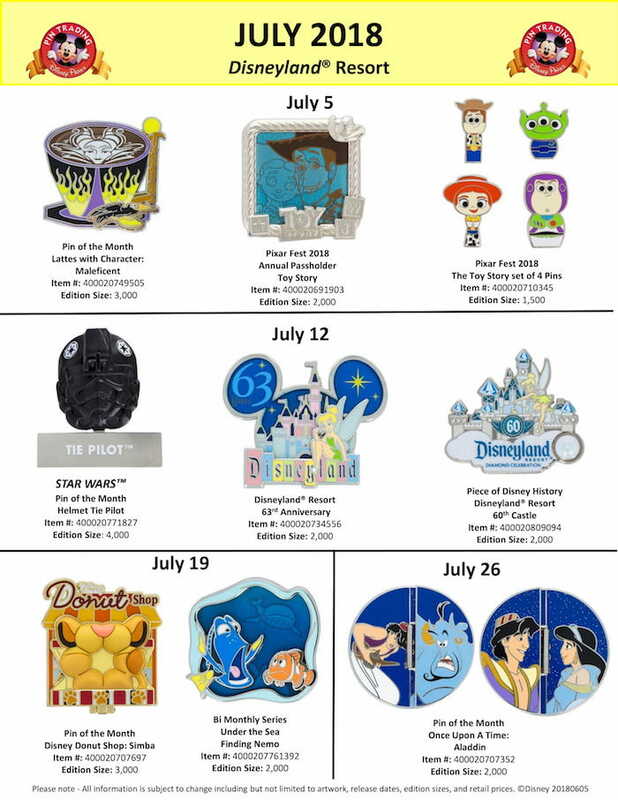 Here is a look at the July 2018 limited edition pin releases at Disneyland® Resort and Walt Disney World® Resort! 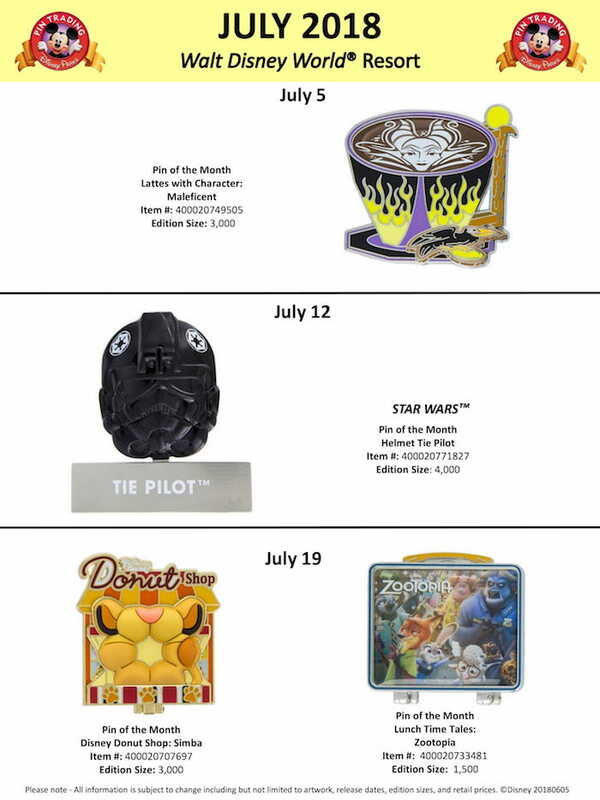 Check our weekly pin posts for additional pin releases. About the finding Nemo mini event, do you rsvp ? Or I can go to the park and buy the pins? i can’t wait for the toy story pins!!! Where are the piece of history pins sold? Inside the parks or outside? The POH pins can be found in Downtown Disney at the Pin Traders store or inside both DCA and DL at the stores where pins are usually sold. Why is there no Piece of History pin for WDW in July? Muppet Vision 3D was it? I don’t think there will be one every month. There aren’t many attractions that closed or went under a major refurb recently that would give them pieces for the pins. Has anyone been able to get any confirmation on whether or not the Windows of Evil pins will be coming back? I heard from a cast member that they had to push back the release for the WOE pins until August. They didn’t say which day specifically but that they would announce it once they knew. 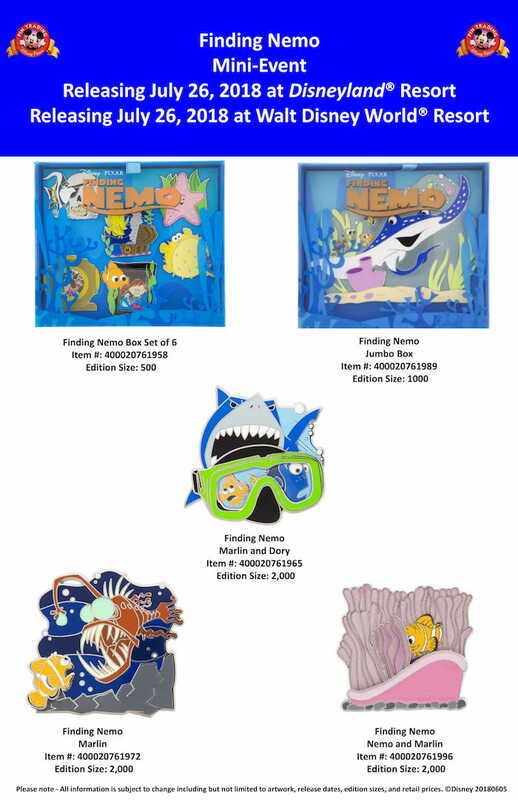 Hi, do we know if the Finding Nemo Mini Event pins will be available in Disney Springs or only inside the parks? Hello, I just returned home from a trip to WDW. I was asking about the American Adventure pins and a castmember told me that when they were released earlier and sold out in one day it was a mistake….and that there will be another release of the majority of the pins sometime in July. Have you heard any info regarding the previous release being done in error? It would seem to me given it’s theme, this set should have been released for Independence Day..but who knows. Is anyone as excited as I am that they are releasing a Zootopia pin? Where are you able to get these pictures from? The site that used to have them only goes to the Disney shop online. We work with Disney to promote them. Has any info been released on the Nemo mini-event? Ie: when/where/how they will be selling the pins? Will it be first come, first serve or a drawing? Can I get the Nemos in the morning when the OUAT pin goes on sale or if I will need to hang out at the Parks until evening when the pin events are usually held. Thanks for any info! Any word on POH for WDW for July? Just wondered if there is a site/location where you get your monthly pin release “sheets”, or of they are an item you create on your own?